Woodrow Wilson's Stanley King (right) and his coach, Preston Brown, talk after King committed on Wednesday to Rutgers. The last hat on the shelf was a tight fit. Stanley King didn’t mind. He still loved the look. 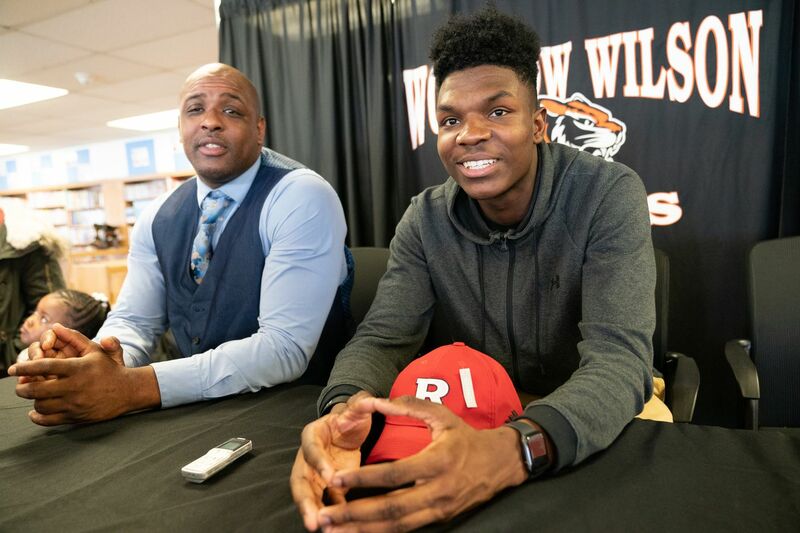 “Rutgers has been with me since my freshman year,” King said Wednesday after signing a national letter of intent to accept a football scholarship from New Jersey’s state university. King a senior at Woodrow Wilson, announced his decision before a crowd of teammates, family and friends in the media center of the school in East Camden. He fiddled with an undersized red Rutgers cap that Woodrow Wilson coach Preston Brown picked up at a sporting-goods store after the Tigers’ basketball game on Tuesday night. “Last one,” Brown said of the hat. The 6-foot-5, 205-pound King was the most prolific wide receiver in Woodrow Wilson history. He finished his career with 148 receptions for 2,516 yards and 28 touchdowns, all school records. As a senior, King caught 79 passes for 1,413 yards and 15 touchdowns in sparking Woodrow Wilson to a 9-4 record and the South Jersey Group 3 championship, the program’s first since 2001. King narrowed his choices to Rutgers and Western Michigan, the school with which Woodrow Wilson quarterback Nick Kargman signed in December. Kargman sat in the front row with a group of other Woodrow Wilson players during King’s signing ceremony. King said he was attracted by Rutgers’ proximity to his home in Camden, by the Scarlet Knights’ membership in the Big Ten and by the opportunity to help revitalize the home-state program. Rutgers was 0-9 in Big Ten play and 1-11 overall last season. The Scarlet Knights scored just 162 points. “They need offensive guys and I want to go up there and do my thing,” King said. “They need big receivers. I bring height. I bring speed. I can get vertical. I’ll be a deep threat for them. King, rated as a three-star recruit by ESPN.com, originally committed to Louisville in the summer. He withdrew after Cardinals coach Bobby Petrino was fired in November. King’s older brother Travon is a freshman linebacker at Temple. Travon King originally committed to Rutgers before changing his mind. Brown, a former Woodrow Wilson star who has turned his alma mater back into a South Jersey power in his four seasons, has long regarded Stanley King as the foundation of his rebuilding project. “He’s Mr. Everything around here,” Brown said of King. “We used him to give tours. He reads to little kids. You can’t duplicate him.